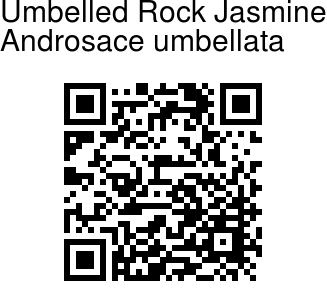 Umbelled Rock Jasmineis is an annual herb 5-11 cm tall. All leaves are at the base, around and long-stalked. Leaves are 0.5-2.1 x 0.6-2 cm, round-kidney-shaped to nearly round, somewhat toothed, velvety. Leaf-stalk is 2-3 times the blade length, 1-3 cm long, hairy. Flowering stems are 3-12 in number, unequal, the largest up to 10 cm long, slender, glandular-velvety. Umbels are 3-9-flowered. Bract are 2-3 mm long, ovate or lanceshaped-ovate, hairy. Flower-stalks are 1-3 cm long, up to 3.8 cm in fruit, slender, glandular-velvet-hairy. Flowers are white. Sepal tube bell-shaped, cut upto two third. 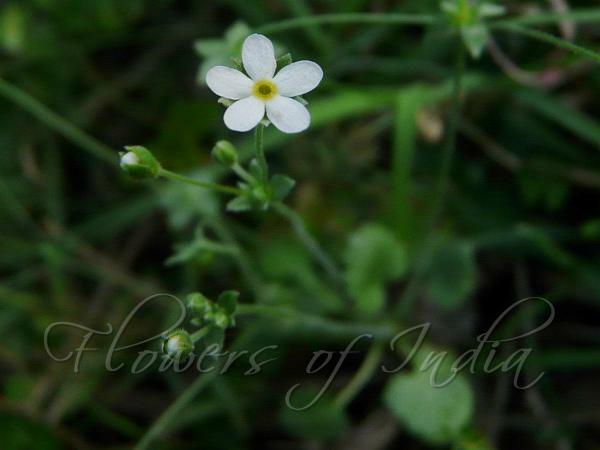 Sepals are 3.5 mm long, unequal, elliptic-ovate, 3-nerved, velvety. Flower-tube barely exceeds the calyx, limb 4-4.5 mm broad; petals 2-2.5 mm long, oblong to obovate. Capsule 3.5-3.7 mm broad, globose. Seeds 12-50, less than 1 mm long. Umbelled Rock Jasmine is found in Pakistan, Himalayas, Kashmir to Sikkim, China and Japan, at altitudes of 270-1500 m. Flowering: February-April. Identification credit: Amit Kumar Photographed in Naukuchiatal & Dehradun, Uttarakhand.